Tune in to The Graduates this Tuesday for an interview with Aaron Pomerantz from the Department of Integrative Biology at UC Berkeley. Aaron is a PhD candidate whose research is focused on color in the wings of butterflies and moths. He talks about the genetic factors that lead to structural color in butterflies and transparency in moths. He also discusses the new technologies that have enabled scientists to perform genetic tests outside of labs. 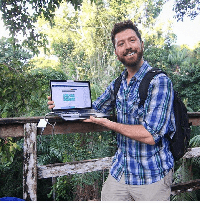 He developed the "Genomics in the Jungle" field course in which he teaches students how to sequence DNA in the Peruvian Amazon.